The Historical Center's history is tied closely with the Bassett Branch Library. Both were a part of the early efforts made by members of the Bassett Garden Club, spearheaded by Mrs. Effie Noland in 1939, who dreamed of a Library for the community. In early years, the genealogy material was housed in a single file cabinet and one shelf. Until the flood of Labor Day, 1987, the material was kept in the Library basement. Immediately the need was realized by the Bassett Public Library Board to bring this material to the upper level, which necessitated a building addition. This addition was realized in November, 1988, and housed the genealogy materials and the children's area. Genealogy was kept in the current War Room. 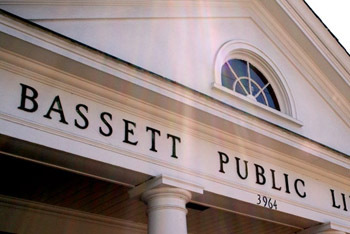 In 1992, the Bassett Public Library had become a part of the Blue Ridge Regional Library System. The Bassett Branch was again bursting at the seams and the Board of Directors named a committee to lead a community effort to raise money to purchase the building across the street for the "regular" library. This project was completed in November, 1998, leaving the genealogy materials in the original building. For a few months the staff thought it might take a very long time before all the shelves would be needed; however, with collections continually donated to the Center, a new addition which doubled the space had to be built in 2010. The early collection consistently grew through the efforts of dedicated people such as Mrs. Effie Noland, Mrs. Shirley Brightwell Bassett, Mrs. Lelia Adams, and Mrs. Martha Jane Clark. The present-day collections are growing due to the staff and the volunteers who faithfully care for the patrons and the data on the shelves just waiting to be uncovered again. Patrons and researchers have been extremely generous with their files and books. The Center currently houses over 15,666 genealogy books and items, approximately 9763 genealogy family files including 995 genealogy files in the Pilson Collection, over 2980 local history files, 131 personal computer genealogy collections and 263 different periodicals. Local company collections from DuPont, Tultex, Bassett-Walker, and Blue Ridge Hardware & Supply Co., are housed here. Henry County is one of the seven counties in Virginia that has a Cohabitation List. Slaves were not permitted to marry legally but did have families, with the counties keeping records of which slaves were cohabitating. Also available is the "Afro-American Marriages of Henry County, Virginia", by Harris and Millner, which would be helpful to find an ancestor dating back to the early or mid-1800's. The collection of Mr. John B. Harris, African-American educator and historian, is also housed here. Mr. Richard Gravely is responsible for the "Bicentennial Collection", a collection of county records and loose papers found in the Henry County Courthouse, being housed here. Researchers have visited the Historical Center from every state in the Union and from Sweden, Switzerland, South Africa, Thailand, England, Canada, Luxembourg, Taiwan, and Italy. The information in the Historical Center focuses on, but is by no means limited to the 5 immediate counties in Virginia: Henry, Patrick, Floyd, Franklin, Pittsylvania; and 3 bordering counties in North Carolina: Rockingham, Surry, and Stokes.